Very brave. Lets start a mission to save the nation from greedy politicians. Our nation needs young people like you all. In my opinion time is running out. We are on our way to to be a failed state. Kudos to Kate and her students! i hope kimboo will be in good hands soon. Now this is quality education! Teaching kids to care! Free all the ANIMALS in all the zoos in the world..!! Maldivian children also love the kimboo. Australians..why don't you assist Maldives to build a better kids park with that kimboo. We are not the only nation holding a kimboo in a cage! kimboo deserves to live a good life. the life it is currently being forced to live, has very poor quality. it is not able to express natural behaviour. it needs to hunt and roam and take part in other natural behaviours, for it to feel good and be healthy. all we need to do is NOT put it in a cage. Release it the next time "rathah araameehun" come that side. It was caged by them. Crocy will get revenge and if to make peace this will be moved to Alivaage. This is good. Activism and good values should be promoted at an early age. Just make a larger enclosure and get someone trained to move it (ie: not some rambo Maldivians who "think" they can do it). The moment they start making an enclosure though, DRP will pipe in and start saying how MDP makes new houses for crocodiles but not it's people. its hi time someone said something about it! we are teaching bad values to children by keeping wild animals captive and in such poor appalling condition this kimboo is in! best of luck billabong high kids and wish you the best of luck in your endeavor. I really love this idea. The cage is so small that the Kinboo would not even be able straighen its backbone any more. Contact 'Parco Natura Viva' in Italy. They might take this Crocodile. Just try! I am surprised with all the noise about this crocodile ..
Really its not the only animal living in a miserable condition at the children's park. There are plenty of other animals there, rabbits, cats etc. So why the hassle with this one crocodile, there are two things that happen to crocodiles or any other dangerous animal when they stray too far away, they either get pelted and beaten to death.. or they get a small enclosure with free food, so I would say hes quite lucky to be there. and its not only crocodiles that are living in cramped up conditions in Maldives, around 60% of the human population in Male' is living in cramped conditions with no free food either. Please Save the People, While Saving the Crocodile, Please Give People Larger Enclosures too!! So if your trying to send the crocodile to Australia, Please try and send some of the people too. You can't even leave the poor Billabong kids and their school project alone now can you. Shows exactly the level your mind works on. Kimboo: "Give me liberty or give me death!" The croc may not be kept in the best possible condition. But for educators to take children to the street and to infiltrate their minds for activism is a cause for concern. I doubt if these children are getting the best examples to follow, and are being guided by the right role models. The kids could have been urged to send a collective letter or something to the related officials expressing their concern rather then grooming them to become activists. send the crocodile to theemuge swimming pool..
sad to see even this is being related to politics in many of the comments. It is a positive change that kids are being introduced to activism and standing up for causes they believe in. Hey! Sounds true to the core! While giving the 'kimboo' a good enclosure, we need to think about the poor Bengalis also! I really think the innocent Billabong kids are being used as human shields by some GODFORSAKEN cowards! Otherwise childrens' natural demand would be to keep the 'kimboo' in a NICER place. NOT to see it off to Australia! I would like to see such 'cowardly' people to go and open the mouth of the 'kimboo' and spend some time brushing the teeth of kimboo. YOU WILL ENJOY IT. The only problem is YOU CAN DO IT ONLY ONCE. SLURP! I fully agree that something has to be done to the Kimboo (and the cats and other animals as well, by the way). Either move it abroad to a proper zoo with proper caretakers, or bring them over and build a proper crocodile enclosure, so that visitors can still enjoy it in Male. This is the first time I can see some activism for animals other than sharks and sea turtles here. I have a dream of animal rights and a commitment to CITES in the Maldives. Who actually cares? A handful of people. Thousands of pets here, and not a single veterinarian. Birds' wings being cut off, sea turtles being kept in wells, cats being beaten to death "for fun", the list goes on. Nobody bothers about the animals - everything here is either politics or religion. Well done Billabong Kids, keep your enthusiasm up! Fire Ziyattey and hire Crocy! We should keep things into perspective! save the kiboo. But the kiboo cannot go to Australia it has not passed the IELTS exam. Australia needs IELTS and a million dollars in the account for an Asian to enter Australia. WHO IN THE WORLD HAS EVER HEARD OF A CHILDREN'S PARK WITH MULTI COLORED SLIDES, SWINGS SETS AND A MAN EATING CROCODILE! The croc doesnt fit into the context. im pretty sure it knows this too and wishes it was alongside other predators in a proper zoo! not a children's park. its a shame to the kimbu's reputation built over 200 million years! seriously remove the bloody thing from that place or set it free. thanks billabong kids for bringing the matter of the croc into nationwide light! better get rid of all the killer mosquitoes first ..do a nationwide campaign to get rid of dengue mosquitoes..!! How did a Crocodile get imported into the Maldives in the first place? Was it smuggled out of Australia? Isn't it a problem to introduce a new creature (an ugly Aussie Croc) to our fragile environment? Who gave the permit? Is the Fishery Ministry to blame since they give such permits? Or is it because there are no quarantine laws? Finally, was Maumoon family involved? It's not an initiative by kids. Some GREEDY cowards are eating away children's brains to get a FREE 'KIMBOO' to sell it high on the open market and earn some $$$$$ !!! If it was a childrens' initiative THEY would have campaigned for a NICE park to keep the 'kimboo' - NOT SEE IT OFF TO AN AUSTRALIAN ZOO! Try watching a little bit Nat Geo, and you will learn that the real aim to earn $$$ not the love of ANIMALS! heck, dude get that giant chip off your shoulder. Rescued animals are not sold off. Instead of building a zoo to keep it in, since Male does not have enough land, i support the move to take it somewhere else. On top of it, we only have a crocodile to keep in the zoo, no other animals. Good thing that children are involved. All those who criticize, leave those armchairs and do something about the issues that you are rising. Verena, bloody barbarians. Decendents of pirates. Thats what we are. I ask God for forgiveness for all the suffering and misery I caused as a child to the countless number of dhondhooni, loafidhu, baburu, fidhana, bulhithun, rathafai and velaa kahabu as a child. As I child I was told they were all created by Allah for our fun enjoyment. So we could treat them any way we want. What about the birds....not only Kinboo, if they are fighting for the Kinboo, i cannot agree with this, they should raise their voice for all locked Birds too. Thank you, Billabong High students. It is a long overdue mission. once in an interview an official from mndf said they give kimboo restricted amount of food, in order to restrict it from growing properly. he said this as if he was doing a smart thing. but the truth is it is so inhumane. So it was 12 years ago huh...I dont remember how the dates went..A boat full of cadets saw the croc. It was somewhere around 8 o 9 at night.. 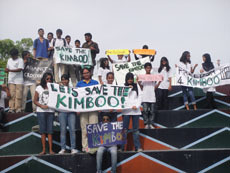 I WAS THERE and painted those banners and we really want to save the kimboo.